The gold metal dowsing rods swing back and forth as Betsy Miller asks the ghost in Jill and Chase Shollenbarger's family room a series of questions. It’s the second time Miller and her Cincinnati Ghost Seekers colleagues have visited the Shollenbarger’s Fairfield home to assess whether it’s haunted. “If there’s anyone here tonight, would you please make the rods cross each other?” Miller says. She extends her arms in front of her. The room is dark and silent. Slowly the rods begin to cross, and she has her answer. It’s scenes like these that prompted Miller to become a member of Cincinnati Ghost Seekers, a group of eight local people who document and investigate paranormal activity in private residences and businesses in the Cincinnati area. Robert Hoskins, 41, formed the group with his wife, Amy, in 2013. He had his first paranormal experience at age 16. He says he was sitting in his house he saw a mysterious figure, which he believed to be a Confederate soldier who was missing a leg. “He turned and looked straight at me with a smile on his face and just walked away,” said Hoskins, a delivery worker from Hamilton. To this day Hoskins still can’t explain what happened. Hoskins hunted ghosts on his own for 15 years when he decided he wanted to work with others who had experienced paranormal activity. So he set up a website to recruit others. It took 183 days before anyone contacted him. Slowly, the group grew, and now its eight members meet at least once week. The group is trying to prove “there’s something out there,” says Rhonda Marsh, a 53-year-old grandmother from Forest Park. They post what they learn on the internet. “We are doing our best to provide (the public) with the most accurate information” about paranormal activity, she says. Genuine interest drives them. No one is paid. When the group goes to a home or business, the visits are free. “If you come across a paranormal group that tries to charge, they’re not legit,” Hoskins says. “It’s a public service,” says Greg Miller, 61, who is married to Betsy. The couple lives in Fairfield. During the day each member works at a normal job -- at Amazon, Budweiser Brewing, Brentwood Bowl, Ashland College, Wal-Mart Pharmacy and McCluskey Chevrolet. All eight pride themselves in investigating properties before entering them. “We like to sit down and talk with the person and kind of get an idea on what’s going on,” Hoskins says. Chase Shollenbarger always thought something in his home was a little off, which what prompted him to call Cincinnati Ghost Seekers. “From the very first time I moved in this house, you could hear faint 1920s music through the vents," Shollenbarger says. When his now wife Jill moved in over a year ago, things got even stranger. On this mid-October evening, the group’s second visit to the Shollenbarger’s home, seven members sit huddled, each searching for an answer to what’s haunting this space. “We work with each other… we bounce ideas off each other and work as a team,” says Betsy Miller, 57. The group makes themselves comfortable, unloading their gear onto the coffee table in the middle of the room. The gear includes a Rem Pod and K-II EMF Meter, ready to identify any spirits. The group brings these devices and others, which they purchased with their own money, to every investigation. Roles change depending on the venue. 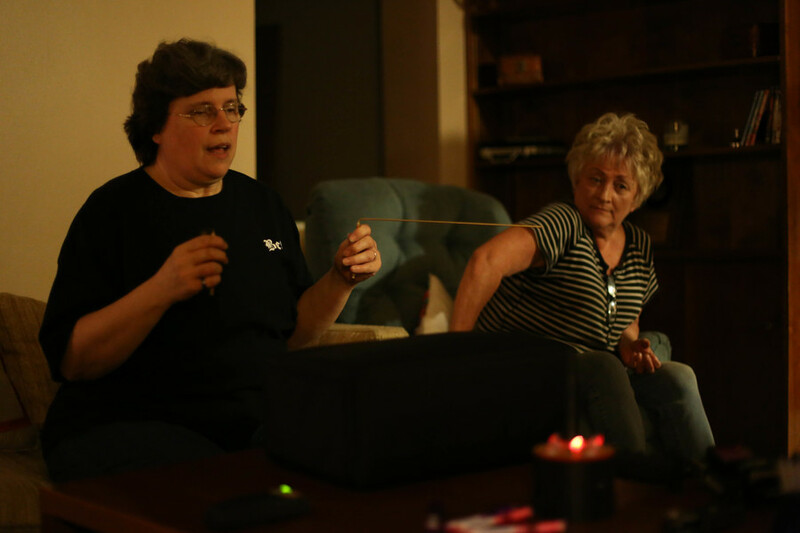 For this ghost hunt, Betsy uses the “L” shaped dowsing rods to contact potential spirits. They’re “free-moving,” meaning Betsy can’t control which direction they move. She rubs the rods on her pants before extending them in front of her. Her eyes peer over the rims of her glasses as she prepares to ask another question. She breathes in, then exhales deeply. The left rod moves away. The room is silent. Her eyes widen, looking in the direction of Jill and Chase Shollenbarger. Through her series of questions she gets a strong feeling about the spirit. “Is your name Ruth?” Betsy asks. “Make the rods cross each other if it is.” Without hesitation, the rods cross each other. As she tries to communicate with the presence, another member of the group, 36-year-old Brad Woodward from Middletown, uses a computer monitor attached to an Xbox Kinect to try to confirm that it’s in the room. “As you see on the video, there’s no one standing right there,” Woodward says. But then a fluorescent green stick figure dances across the screen. Ruth needs to pass on, Betsy says, but she can’t because the attic is sealed off. “I’m drilling a hole tomorrow!” Chase Shollenbarger. Weeks later, things have quieted down at the Shollenbarger’s home. After the group’s first visit, there was no activity for three weeks. Then the spirit started to act up again. This time, they are waiting to see if Ruth is gone for good. Sarah Sikora wrote this story for the Media Bureau journalism class at the University of Cincinnati. The class produces multimedia stories for syndication to local news outlets.